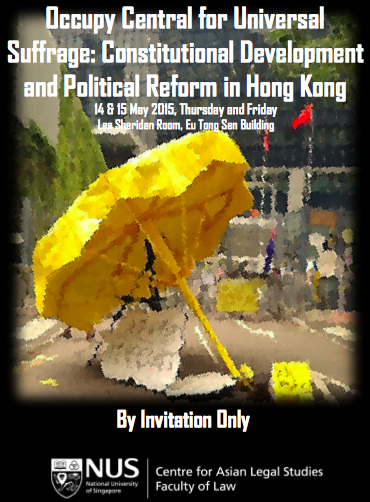 The National University of Singapore (NUS)'s Centre for Asian Legal Studies is hosting a two-day conference entitled "Occupy Central for Universal Suffrage: Constitutional Development and Political Reform in Hong Kong" on 14-15 May 2015. Four Faculty members will be speaking at this event. Michael Davis will present on "The Beijing Decisions, the Umbrella Movement and the Rule of Law in Hong Kong". Simon Young will address "The Process for Realizing Hong Kong Universal Suffrage: How Could We Have Done Better?" Dr Po Jen Yap will present, "The NPCSC Decision of 31 August and Occupy Central: Doubts, Dilemmas, and Dangers". Hualing Fu's paper is entitled "Civil Participation in Hong Kong and Constitutional Dialogue with Beijing". The workshop features other speakers from Tsinghua University Law School, City University of Hong Kong Law School, Shanghai Jiaotong University Law School, Shenzhen University's Basic Law Centre, Academia Sinica, NUS and several media organisations.